Does it really work in 14 Days? Yes! The kit contains all you require to remove up to 10 large areas of pigmentation. Apply twice daily for up to 14 days. Smaller thinner areas may require less treatment. In most cases no, although we cannot guarantee this as everyone’s skin is different. We recommend that you first test the product in a cosmetically unimportant area before application to the face. After treatment the pigmentation will form a scab, you should allow the scab to flake off naturally without picking. The fresh new pink skin revealed beneath will slowly blend in with the surrounding skin. 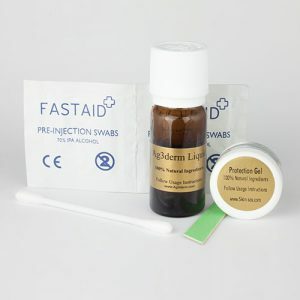 Each pigmentation treatment kit contains one 5ml bottle of solution which is adequate to treat up to 10 large keratoses twice a day for up to 14 days. When the solution is applied a slight stinging sensation will be felt for 15 to 20 minutes. The solution will begin to react & bubble when applied, as it attacks the surface of the pigmentation. When the solution stops reacting the stinging should stop, it will dry to form a white residue. What about other products that claim they remove pigmentation? Most other products on the market take weeks of daily applications, or involve hydroquinone which is thought to be linked to skin cancer. The solution must only be used on clean dry skin. Is the Pigmentation Treatment Kit safe to use? Our pigmentation treatment kit does not contain bloodroot, hydroquinone, or liquid nitrogen. If used correctly it is very safe, & all ingredients are 100% natural. If the kit does not work for you we will happily refund the full purchase price. Please email us with your order details within 30 days of receiving your product for details of our returns policy. We are not able to refund shipping costs. The ingredients are: H2O2 FG Hydrogen Peroxide, Plant Extracts, Natural Vitamins, Petroleum Jelly. To purchase you must be over 18 years of age. The liver spot is near to my eyes, can I use the kit? We do not recommend that you use this product near to your eyes. The kit can be used to remove any skin condition involving a surface build up of excess keratin.